Red Ochre Powder - Mahaveer Mineral from India. We offer Red Ocher Powder which is a dye obtained from an impure earthy ore of iron or ferruginous, usually powder (hematite) or yellow (limonite). In addition to being the principal ore of iron, hematite is a constituent of a number of abrasives and pigments. Red Ochre which is a pigment that has been used since a long time. They are very rich in the mineral oxide and they are obtained from clay. We ensure that the products are of a very high quality and they are available to the clients within the specified time frame. Holding uniqueness in our business we deal in supply of quality red ocher powder with high hematite content. Natural gas and oil well drilling. 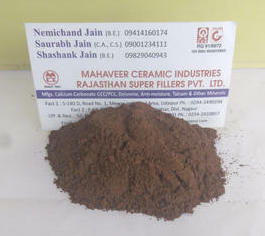 Rajasthan Super Fillers Private Limited, Rajasthan, India becomes an affluent manufacturer, exporter and supplier of Red Ocher Powder in Udaipur, Rajasthan, India. We are providing a premium quality range of Red Ocher Powder. We graded Red Ocher Powder by quality. We reblend the products according to specification, bagged and marked. With consistent focus on quality, our company is engaged in offering a vast range of Heavy Red Ochre Powder. It is mainly used in pharma and paint processing industries.We are well-known for our defined quality standards, engaged in Manufacturing a high grade range of Pigment Powder, Red Iron Oxides, Yellow Ocher Powder, Red Ocher Powder etc.We provide various training sessions to professionals to keep them aware of latest technology.